The USS Greeneville is the penultimate Los Angeles Class submarine, launched in September 1994. Named for Greeneville, Tennessee, the home of Andrew Johnson, the 17th President of the United States, the USS Greeneville has had a somewhat rocky history. On Febuary 9, 2001, the Greeneville hit the Japanese fishery high-school training ship Ehime Maru, sinking it within ten minutes and causing the deaths of nine crew members, including four students. Less than a year later, in August 2001, the Greeneville ran aground at Saipan, damaging the underside of the boat along with the rudder and secondary propulsion motor. Only a few months later, and still less than a year since the Ehime Maru incident, the Greeneville collided with the USS Ogden off the coast of Oman, tearing a hole in one of the Ogden's fuel tanks. Since these incidents, the Greeneville has performed its role without incident. 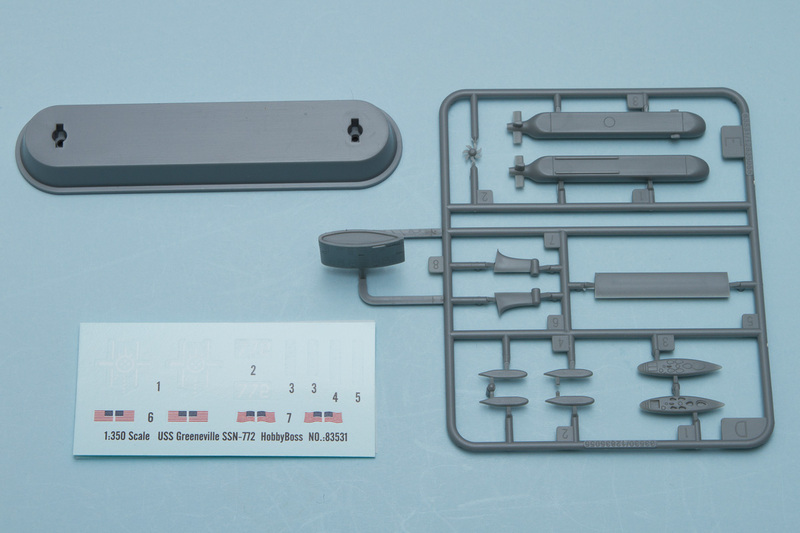 After many years of few submarine kits, we seem to be inundated with new-tool subs in 1/350. Hobby Boss is one of the companies that has been leading the pack with new kits, and their latest one is a Los Angeles Class SSN, the USS Greeneville SSN-772. 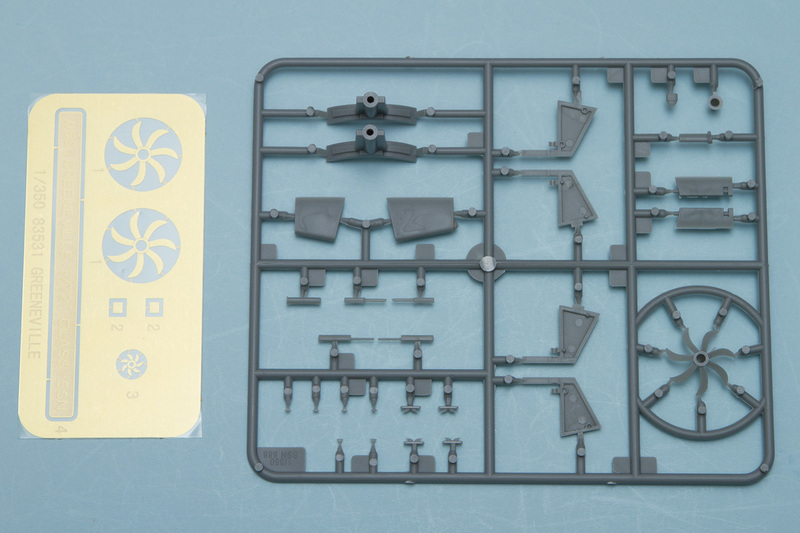 This kit comes molded in gray plastic, with petite recessed panel lines and a photoetch fret with detail parts. The small decal sheet provides the minimal markings found on US subs, but what sets this kit apart is the Advanced SEAL Delivery System (ASDS) that can be mounted on the rear deck of the boat. Starting with the SSN, though, this is split into upper and lower halves. As most of the hull detailing is found either on the top or bottom of the hull, this division is the best choice as it allows for very crisp moldings in those areas. The forward dive planes are separate and get sandwiched between the hull halves, with other hull details including the rear fins and various upper deck bits. The horizontal fins feature separate elevators, and the kit includes the angled fins found on the lower rear hull. It's a bit challenging, but I recommend finding some photos of this area, as the instructions and painting diagram is not clear as to exactly what angle those should be at. The sail is suitably busy, with the main sail provided as a single piece. This fits onto the upper hull piece with a very positive locating system. The top of the sail comes in two options: one with everything closed up and one with everything open. Should you choose the open option, the kit comes with all the various periscopes, antennae, and what-not to make the top of the sail quite busy. The ASDS is a nice touch here, and is split into upper and lower halves. There are four mounting pylons that attach to the hull. 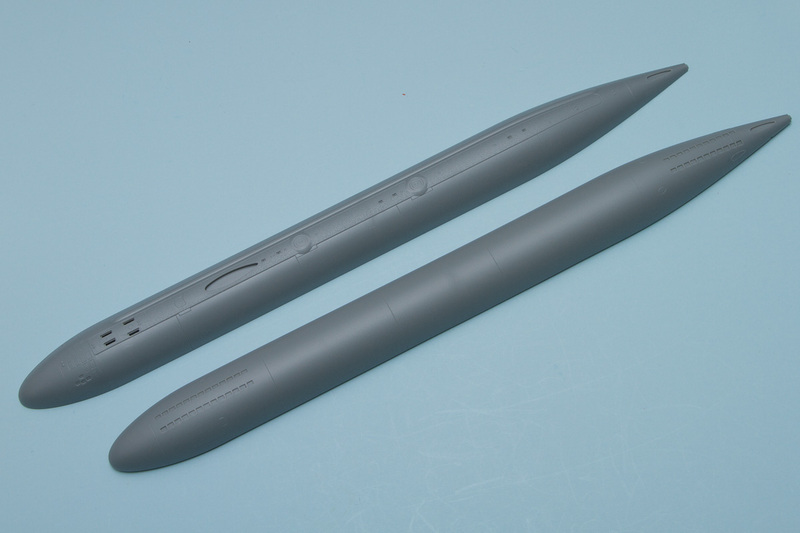 For both the SSN and ASDS there is an option of using either a plastic screw or a photoetch screw. While the plastic screw is good, the photoetch one is much better and I would recommend using that one. The final step is to assemble the stand and then attention can turn towards painting. The painting diagram shows how simple submarine paint schemes are, with the upper hull, nose cone, and tail cone in black and the lower hull in red. This results in a very dull looking submarine, though, so I would recommend doing some subtle shading work on the upper portion, at least. Decals provide the depth markings on the hull and vertical fin, large numbers for the sail, and hull hatch marks, although the latter are not marked on the painting diagram. This is a great addition to the growing 1/350 submarine line available today, especially with the addition of the ASDS. My thanks to Squadron for the review sample.